Back by popular demand, here’s our annual rundown of the top software conferences to attend in the coming year. Last year, we brought you the top 12, but this year we’ve expanded the list to 15. Over the past year, we’ve seen quality become a strategic priority for more and more organizations, and you can see that trend reflected in the growing list of learning opportunities our industry offers. Atlassian is taking their annual user conference on the road this year! The Atlassian Team Tour focuses on three special legs: “Team Tools & Practices,” “Government Symposium” and “Future of Teamwork.” The tour starts Feb. 8 in Amsterdam and will be sure to feature insightful keynotes, fun breakout sessions and epic training sessions. Be sure to check out the full list of cities to see if there’s a stop near you. QASymphony will also be sponsoring the Chicago and Austin events, so be sure to stop by and say hello. As one of the longest-running and most respected conferences on software testing and quality assurance, you can be sure that the STAR Software Testing Conferences, sponsored by TechWell, will be great in 2018! 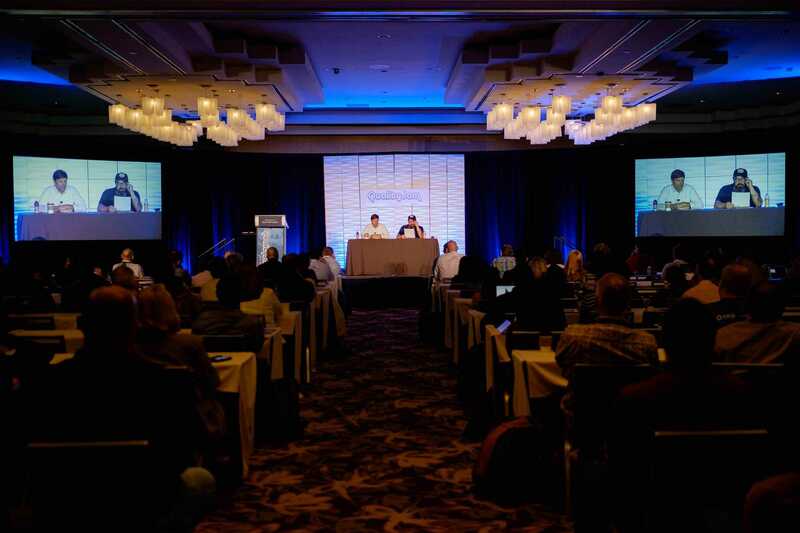 Featuring hundreds of learning and networking opportunities, Stareast and Starwest will offer attendees myriad ways to dive into some of the most in-demand topics and innovations in the software testing space. Starwest is scheduled for Sept. 30-Oct. 5 in Anaheim, Calif., and StarEast will be held April 29-May 4 in Orlando, Fla. If neither of those locations is convenient, you can also attend StarCanada Oct. 14-19. Quality Jam is QASymphony’s premier thought leadership and education destination for quality professionals, technology leaders and agile development teams. For this year’s Atlanta conference, which has doubled in size every year, we are bringing even more thought leadership and practical hands-on advice from industry practitioners and subject-matter experts in everything from test automation to digital transformation. The conference will also include keynotes from DevOps evangelist and practitioner at CloudBees Brian Dawson, Sharecare CEO and WebMD founder Jeff Arnold and the hosts of the Stuff You Should Know podcast, back by popular demand for the second year in a row. New to this year’s lineup is a morning dedicated to hands-on training where you’ll be able to learn from other QASymphony users and our in-house experts about all things qTest. Other sessions include workshops on BDD/Pulse, qTest Insights, best practices, and our product roadmap! Early Bird tickets are also still available, so grab them before Dec. 31 to receive 25 percent off! Quality Jam London will be held on October 18! This is the space for QA professionals to learn where the QA industry is going, and to make connections that drive both personal and professional growth — whether you are a tester, automation engineer, director or VP of quality, or a CIO. This year, we will be bringing back speakers from some of our most popular sessions at Quality Jam Atlanta 2018 including Adam Satterfield, who presented a great keynote on “Effective Quality Leadership.” Joining him will be Mikey Warner, Director of QA at Office Depot -Europe and many more! Early Bird tickets are on sale now and get you 50% off! UKSTAR is a new two-day software testing conference organised by EuroSTAR. Taking place on March 12-13, the conference encourages all software professionals “regardless of your approach to testing, your chosen school of thought, your affiliations or accreditation” to join. SauceCon aims to bring together the global community of Sauce Labs users and automated testing experts. Hoping to help teams learn from each other and level up their automated testing and continuous delivery skills, the conference will feature speakers from Buzzfeed, USA Today and Salesforce. Deliver Agile is a three-day conference that seeks to address new advances, new challenges and new directions in the agile testing field. The conference will focus on topics including: DevOps approaches and technologies, cloud computing technologies and patterns and user experience (UX) design and implementation. The conference takes place on April 30-May 2 in Austin, Texas. Atlassian Summit Europe, scheduled for Sept. 4-6 in sunny Barcelona, is Atlassian’s annual user conference and biggest event of the year. 2018’s event will feature training, a developer bootcamp, a wide variety of keynotes and sessions and a diversity in tech bootcamp. According to the hosts, you can expect “an unforgettable night of delicious food, bottomless drinks, music, and entertainment—all on the house!” Count us in! Jenkins World is the conference for Jenkins experts, continuous delivery thought leaders and companies offering complementary technologies for Jenkins. This year’s event is scheduled for Sept. 16-19 in San Francisco. Expect workshops, networking, training, and a nice break from the typical conference party scene with healthy activities such as a fun run and morning yoga session. Held over four days in November in the Hague, EuroSTAR will include over 60 sessions including tutorials, workshops and talks celebrating the craft of testing. The 2018 conference marks the event’s 26th anniversary and features talks from industry big-hitters like Tony Bruce and Michael Bolton. They will also be hosting a 5K Fun Run and Test Lab (where you can expect robots and games!). The QA Financial Forum has quickly become established as the leading conference for software quality assurance and IT risk management professionals in the financial sector. The 2018 conference lineup includes multiple events scheduled in major cities around the globe next year — New York, London, Milan and Chicago. Expect a balance of security, compliance and new technology topics. The Agile Dev Conferences, hosted by Techwell, focus on the latest in agile methods, technologies, tools and leadership principles, from project management to test automation. Agile Dev West is scheduled for June 3-8 as a standalone event, while Agile Dev East runs in conjunction with Better Software East and DevOps East. Both events will feature keynotes from recognized thought leaders in the agile field. Cukenfest is an annual event in London catering to the BDD and agile community that is limited to just 150 people. The small, interactive two-day conference features one day of short talks and another of “unconference.” Last year’s event included short talks, fun games, and lots of time to chatter, according to the website. TISQA’s 2018 Conference focuses on promoting the importance of quality in software — and that’s a mission we can all get on board with! This two-day conference and workshop in Raleigh, N.C., is hosted by the Triangle Information Systems Quality Association (TISQA) and focuses on all things testing. . This year’s conference will explore the question, “What is a tester?” as the role has changed over the years as organizations have shifted from waterfall to agile and beyond. Workshops will start on Feb. 27 and the full conference will be held on Feb. 28th. OOP, the Conference for Software Architecture, will feature more than 160 sessions covering 13 topics over five days. The conference’s tagline, “software meets business,” captures the spirit of this Munich-based event, which focuses on topics like agile, AI, machine learning and modern programming. Speakers scheduled for this year’s event include Debra Lavell from Intel Corp. and Donovon Brown and Abel Wang from Microsoft. There are also lots of fun events and activities planned throughout the conferences including all-you-can-eat sushi, a game of IT Capture the flag, and more. Claiming to be a conference “organized by Testers for Testers,” Swiss Testing Day 2018 is a one-day conference that takes place in Zurich March 14. Sessions will focus on practical approaches to software testing with speakers from House of Test, Netcetera and more. One particular session will introduce a set of testing games you can play with your team to learn more about analysis, modeling and test design. We hope to see you at some of these great software testing conferences in 2018!